The quality protein and calcium levels in alfalfa mean that it is a natural fit for breeding and youngstock. For breeds and types that are good doers, a stud balancer fed alongside the Alfa-A range supplies all the essential nutrients required for growth and development without the levels of starch that have been linked to DOD and that can result in over-exuberant behaviour. Feeding alfalfa alongside a traditional stud mix or cube encourages more chewing and therefore better digestion of the feed. Protein is not the cause of DOD – numerous studies have shown that high planes of nutrition with insufficient minerals to support the rate of growth are the biggest problems. Not all fibre is the same – sugar beet and alfalfa are more digestible than straw for example. More digestible fibre sources are broken down more readily in the digestive tract and help to reduce bulk sitting in the digestive tract – ideal for reducing a hay belly appearance in youngstock being shown or prepped for sale. I have heard that weaning can cause ulcers in foals. Is there anything I can do to reduce the risk? 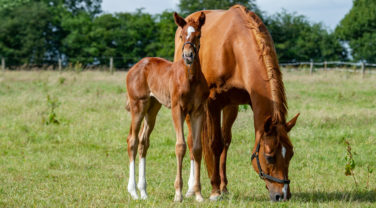 Studies suggest that as many as 50% of foals can develop stomach ulcers which is largely due to the foal’s stomach not being as developed and therefore more vulnerable to damage. Foals are secreting gastric acid by 2 days of age and so rely on the presence of milk in the stomach to provide protection against the acid. 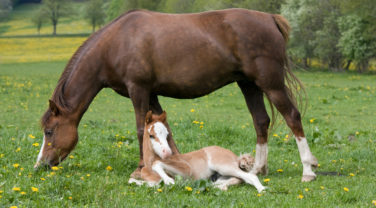 If for any reason they don’t suckle (estimates vary but it is suggested that foals can suckle up to 7 times an hour), the absence of milk leaves them vulnerable to ulcers. Foals that are poorly and so not suckling or those with dams that aren’t producing much milk are also at risk of ulcers. Weaning obviously removes the foal’s supply of milk and if they don’t take to the new diet then the stomach could be empty for a prolonged period. If possible, introducing feed prior to weaning will help to smooth the transition away from a milk based diet. Stress is also a significant contributing factor in the development of ulcers which is unavoidable at the time of weaning. There have been some studies to show that chopped alfalfa is linked to the development of ulcers in the pyloric region of the weanling’s stomach. 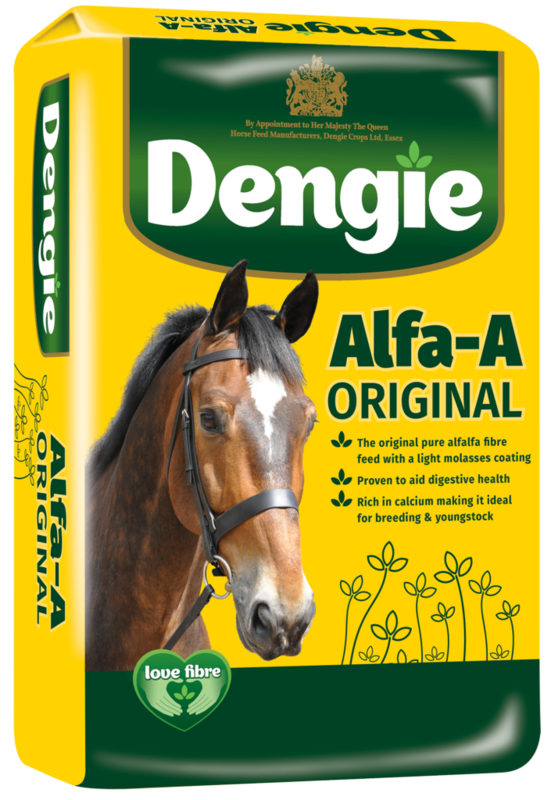 For this reason we would advocate using alfalfa pellets at the time of weaning to capitalise on the potential benefits of alfalfa as a natural buffer but to avoid the risk of ulcers in this specific area of the stomach. My vet has advised that I should stop feeding my yearling Alfa-A as he is growing too fast. Is this the right thing to do? Growth rate tends to be a combination of genetic factors and the plane of nutrition. Higher energy diets encourage a faster rate of growth and if insufficient nutrients are provided to support the rate of growth problems can occur. It is often assumed that the high protein level in Alfa-A is a reason not to feed it but actually, it usually only makes a small contribution to overall protein requirements as a scoop is only 400 grams so it is rare for youngstock to consume more than 1kg a day. It would also depend what else is being fed – compared to a stud mix or cube, Alfa-A is likely to be contributing much lower levels of energy, starch and protein. 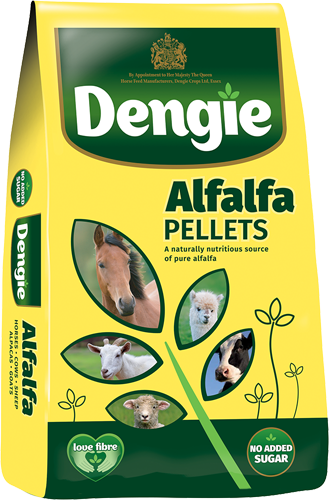 If your yearling is growing rapidly then a suitable diet would be a stud balancer which would provide essential nutrients without a significant amount of energy. This can usually be safely mixed with up to 1kg per day of Alfa-A Original or Alfa-A Lite. 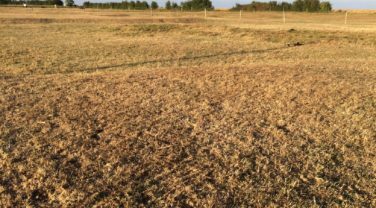 It may be necessary to remove the yearling from grazing if the grass quality is particularly good as this can again be a significant source of energy which might encourage a more rapid rate of growth. When can my foal start having a feed? In the first few months of life the foal’s digestive tract is adapted to digest milk and whilst you may find them investigating their environment, showing an interest in mum’s feed or grazing, it is not until around 4 months of age when the microbial population in the digestive tract changes to being able to ferment and utilise fibre. It is around this time that the foal’s own feed can be introduced to supplement the mare’s milk. It is good to have the foal established on their own feed prior to weaning to reduce stress at the time of weaning. 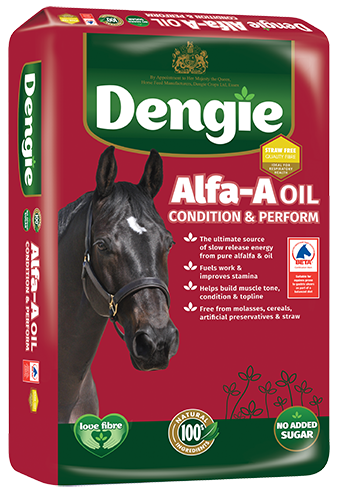 If the foal is at grass and holding weight well Alfa-A Original and Performance+ Balancer may be all that’s required or if the foal needs a little more help to maintain weight then Alfa-A Oil or Meadow Grass with Herbs have an energy level comparable to a stud mix/cube, but without the starch. Meadow Grass with Herbs is naturally a little softer than alfalfa based feeds and may be more sympathetic to the foal’s mouth if they are a little sensitive. Why are vitamins and minerals important for my broodmare – won’t she get everything she needs from grazing if she holds her weight well? 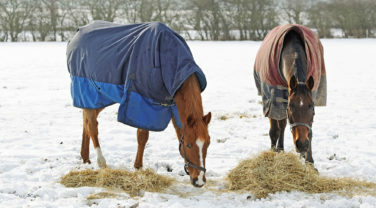 Whilst UK pasture and forage supply plenty of energy or calories for many horses and ponies they lack certain trace minerals including copper, selenium and zinc and conserved forage also lacks vitamin E. Vitamins and minerals are not only important for long term health and longevity, but also for the growth of the developing foetus. If a mare is being supplied insufficient nutrients in her diet she will ‘give’ what reserves she has to the foetus which is doing the greatest amount of skeletal development in the final trimester of pregnancy. In the first pregnancy a dietary deficiency may not show, but in subsequent pregnancies where the mare has already depleted her own reserves a growth problem is more likely in the foal. Copper is one nutrient that has received some attention. Pearce (1998) demonstrated that copper supplementation in mares resulted in a significant reduction in epiphysitis. In non-supplemented mares foals still developed lesions even if the foals were supplemented themselves. Approximately half of the copper found in the foal’s skeleton at birth is deposited in the mare’s third trimester and this really highlights the important of a mare having a balanced ration. The Dengie nutrition team advised Sarah Oppenheimer at Headmore Stud on the best diet to support growth for Headmore Valentina. We all know how difficult it can be to feed a good doer and it can be even harder if that good doer is pregnant or has a foal at foot. It can be a very delicate balancing act to get it right for both mare and foal – and balance is exactly what you’re looking for! Correct nutrition is key to successful breeding and it is important right from the point of conception. The right diet for your mare increases the chances of producing a sound, healthy foal with a long working life ahead of it.